Abad Lopez is a member in Dykema's Chicago office. He is an experienced labor and employment attorney who focuses on representing management in single plaintiff and complex litigation in federal and state courts and other tribunals throughout the United States. He has represented employers in a wide array of state and federal matters, including litigation of wrongful discharge claims, various tort-based common law claims, biometric information privacy claims, harassment claims, and discrimination and retaliation claims brought pursuant to Title VII, the FMLA, the ADA, the ADEA and various other state and local statutes. Mr. Lopez also focuses a significant share of his practice on the defense of complex wage and hour claims, including collective actions under the federal Fair Labor Standards Act and class actions under the laws of many different states. 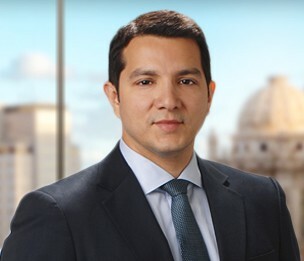 Prior to joining Dykema, Mr. Lopez was a senior trial attorney for Seyfarth Shaw, where he also served in several leadership roles during his tenure. He also served as Assistant General Counsel for Class Actions and Employment Litigation for a Fortune 50 company. In this role, Mr. Lopez managed complex wage and hour and employment lawsuits. His role included managing all aspects of litigation in multi-state wage and hour and discrimination cases. Mr. Lopez has also conducted discrimination and harassment prevention training to corporate managers. He is fluent in Spanish. Mr. Lopez serves as an experienced trial lawyer that multiple Fortune 50 companies turn to for their defense. Mr. Lopez is a member of the Trial Bar and has tried cases in numerous forums, from federal and state courts, to several administrative agencies. His jury trial experience includes the defense of federal civil rights violations and state law retaliation claims. When appropriate, Mr. Lopez has also been able to resolve cases favorably prior to trial. Mr. Lopez has also successfully defended against wage and hour claims through all phases of litigation, from early-stage motion practice, through summary judgment, class or collective action certification, jury trials and appeals. He has defended claims involving the alleged misclassification of independent contractors, exempt status classification, reimbursement of business expenses, failure to provide benefits contributions, detention of tips and gratuities, Sunday and holiday premium pay, missed meal breaks, and off-the-clock work. Mr. Lopez also advises employers on compliance measures, including reviewing employment policies, counseling on disciplinary actions and investigations, negotiating severance and release agreements, and conducting employment practices training and reviews. In addition, Mr. Lopez has negotiated and tailored employment agreements and non-compete, non-solicitation, and confidentiality agreements for a wide range of employers. Gerhard v. D Construction, Inc., et al., (N.D. IL) (obtained summary judgment and dismissal of entire case, including claims for retaliatory discharge under the False Claims Act and disability discrimination under the ADA. Opinion published at 2012 U.S. Dist. LEXIS 35406). "Employers Need to Be Wary About Illinois’ Biometric Data Law"
Board Member, Hispanic National Bar Foundation, Washington, D.C.